We couldn’t help but be inspired by a recent trip to Fez, the ancient imperial city of Morocco. The old Medina with it’s narrow, chaotic labyrinth of alleyways bustling with 250,000 locals, many of them dressed traditionally in head-to-toe woolen hooded coats and looking like extras in a scene from Lord of The Rings, grandiose domed doorways decorated with fine mosaics and mirrors, treacherously steep tiled steps winding up to tremendous views across the roof of the city and to the hills beyond, then back down at street-level, Aladdin’s cave-like souks stuffed to the gunnels with superb handicrafts and market stalls stacked high with fresh veg and herbs and spices tucked into every available nook & cranny along the way! Wonderful! All the senses seemed to be working overtime. Not only were the sights a feast for the eyes, the sounds a symphony to the ears, but so too were the aromas a sensation with every inhalation! The wonderful thing about spices is that they pack really well into a suitcase! I brought heaps home with us! 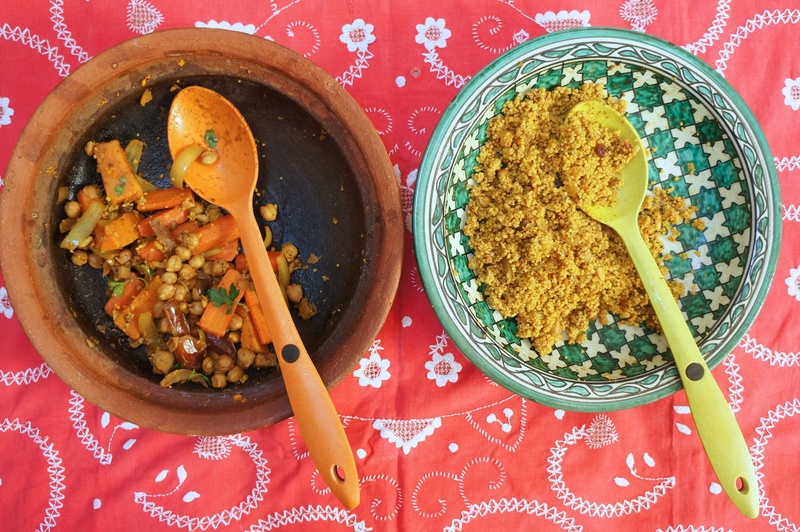 So here is my version of what we regularly ate ~ a moroccan spiced veggie tagine with couscous and dukkha. My kitchen became the kasbah and smelt like Morocco itself! For the tagine ~ 1 sweet potato, peeled & cut into long chunks; 3 carrots, peeled & cut into thirds; 1 onion, chopped;1 tablespoon sunflower oil; 1 teaspoon ground ginger; 1 teaspoon ground cumin; 1 teaspoon paprika; 1 teaspoon ground fennel; 1 teaspoon ground cardamom; 1 teaspoon ras el hanout blend*; 400 gms cooked chick peas; 4 or 5 fresh dates, stoned; zest of 1 orange; large handful of fresh flat-leaved parsley; handful of fresh coriander; 1/4 preserved lemon, thinly sliced – optional; S&P to season. Part-boil the sweet potato & carrot together in the same pan, then drain and set aside. You can reuse the water for the couscous later. 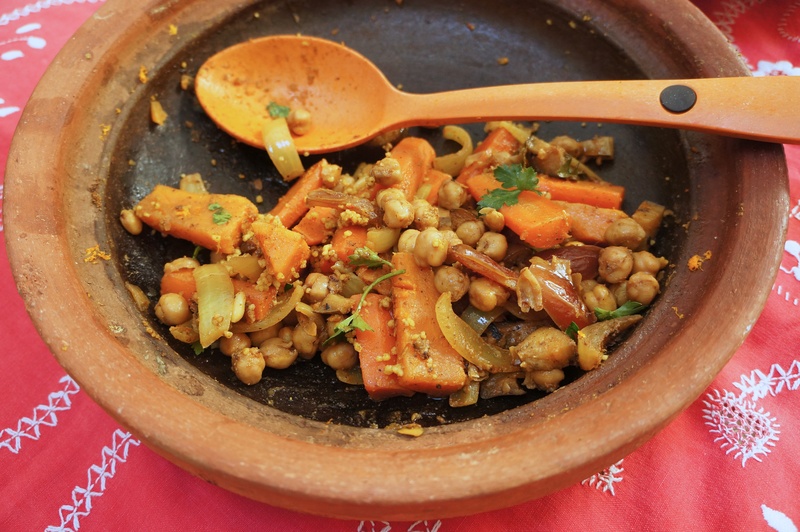 Heat the oil in a heavy based pan or tagine if you have one, then add the chopped onion and stir in. Add all the spices and mix to a fine smooth paste. Add a little water if needed so that the mixture isn’t too dry. Toss in the chickpeas and gently fold in with the spices. Layer over the sweet potato and carrots, and zest the orange over the top. Add the chopped dates, parsley, coriander and preserved lemon, if using, piling them on top of each other rather than mixing in too much. Cover with a heavy lid or the dome of the tagine and simmer very slowly for an hour. You can do this on top of the oven or in it, depending on your preference. Pour out the couscous into a measuring jug or mug. 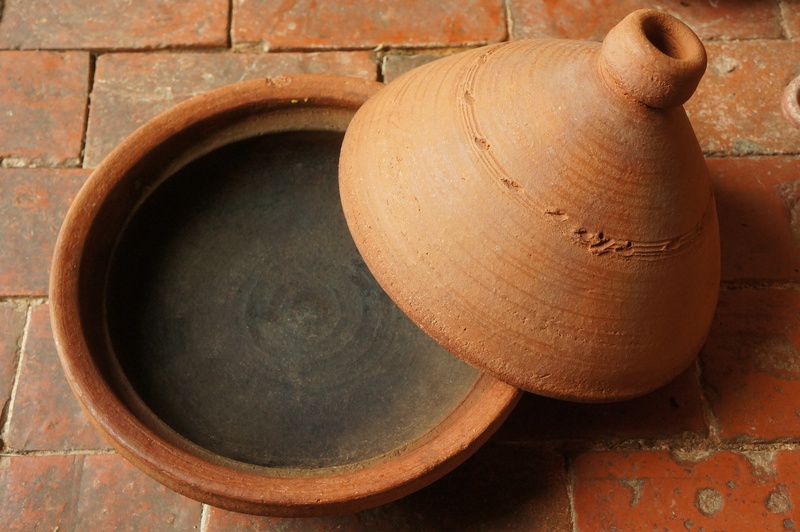 Whatever you use, double the measure to get the right quantity of water to add. Put the dry couscous into a wide bottomed serving bowl which you can fit a lid over. Sprinkle the raisons, almonds and cinnamon on top. Pour over the right amount of boiling water, add the knob of butter, or olive oil, cover with the lid and leave to fluff up for 20 minutes. Uncover and fork through when you’re ready to serve. For the dukkha ~ not to be confused with Duhkka, the First Noble Truth of Buddhism! 50 gms sesame seeds; 50 gms hazelnuts; 2 tablespoons cumin seeds; 2 tablespoons coriander seeds; 1 teaspoon sea salt. 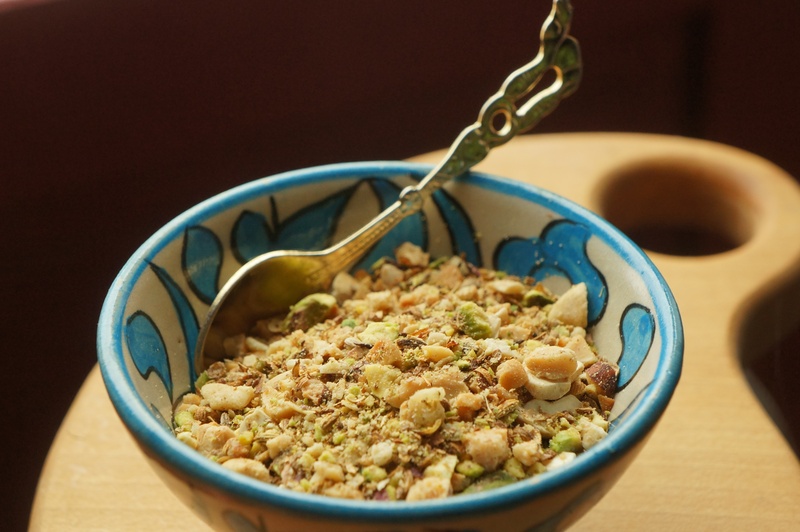 Optional additions ~ 1 tablespoon fennel seeds; 2 tablespoons shelled pistachios. Dry roast or toast all ingredients for a few minutes then grind in a mortar & pestle to crumbs. 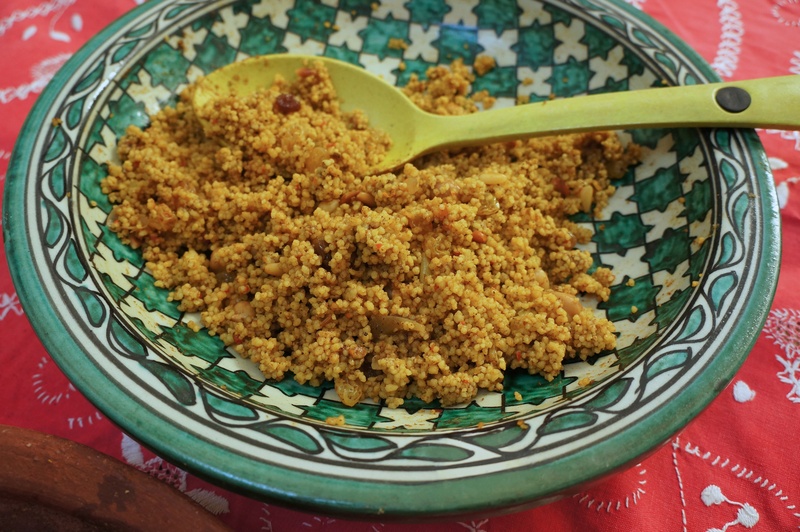 Dukkha, in the food sense, is a blend of seeds which is a staple of Egyptian street food. It goes marvelously well with tagines or couscous or falafels and other exotic middle eastern dishes. Seeds are roasted or toasted and used as an accompanying sprinkle over and delicious addition to the main dish. 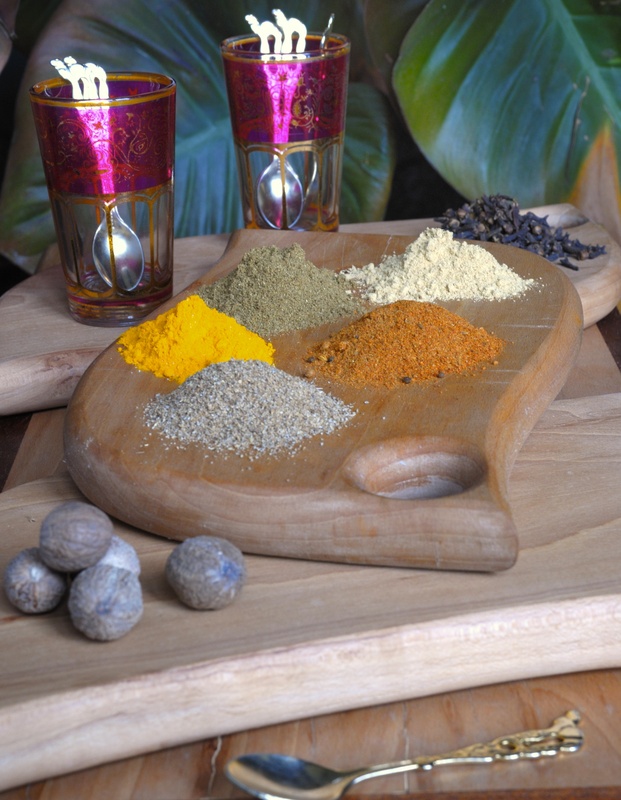 *Ras el Hanout ~ The name means “top of the shop” in Arabic and refers to the best mixes a seller has to offer. Although there is no set combination of spices, typically it would contain cardamom, coriander, turmeric, cumin, clove, nutmeg, ground chilli pepper, fenugreek, fennel and garlic to name but a few! There can be up to 50 spices included in the best mixes, all of which are toasted before being ground up together. It’s a available as a blend in the spice section of most good supermarkets.